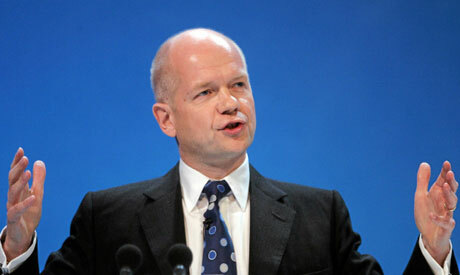 British Foreign Secretary William Hague will accuse Iran of "breathtaking hypocrisy" for supporting revolutions in the Arab world while crushing domestic dissent in a speech Tuesday, The Times said. Hague would condemn Tehran for "suppressing protest at home while claiming to support revolutions elsewhere in the region -- except Syria" in a speech to a seminar organised by the newspaper. Hague's speech would turn the focus on Iran, which has been overshadowed in news coverage by the uprisings in Arab states, the paper reported. "The lessons of the Arab revolutions hold true for Iran just as they apply to repressive governments across the world," he will say, the paper reported. "Demands for respect for rights, open government, action against corruption and genuine political participation have and will spread by themselves over time... because they are the natural aspirations of all people everywhere. "Simply refusing to address legitimate grievances about human rights or attempting to stamp them out will fail." In 2009, Britain and other Western countries condemned Tehran for violently crushing protests that followed the controversial re-election of Iranian President Mahmoud Ahmadinejad. Iran denounced the Western condemnations as meddling in its internal affairs. Dozens of people were killed in the opposition demonstrations protesting what they said was massive election fraud. Thousands more were arrested, several hundred of whom were handed long prison terms. Hague will argue, that the protests were a "precursor" of the Arab revolutions, the newspaper said.